When in Rome, do as the Japanese do. Time-travelling Roman Architect Lucius Quintus Modestus unwittingly adopts this strategy. 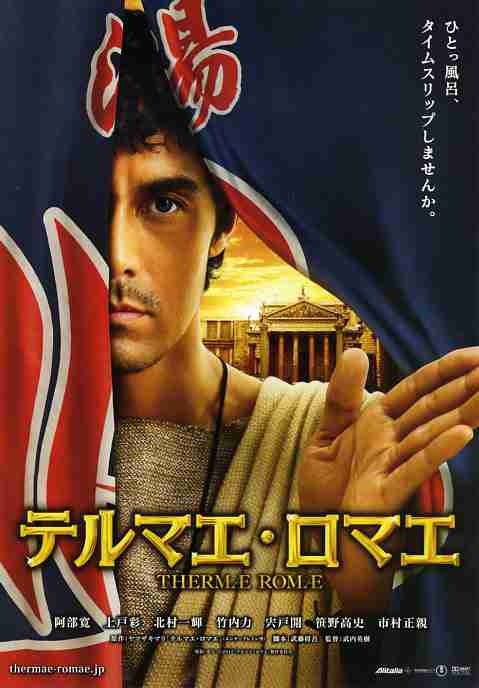 Sure, you might think he looks more Japanese than Roman, but there is no need for pedantry when Hideki Takeuchi’s Thermae Romae (trailer here) screens tonight as a co-presentation of this year’s Japan Cuts and the New York Asian Film Festival. Nursing his wounded pride at a Roman civic bath, the recently fired Modestus is inexplicably pulled through the drainage system into modern day Japan. Initially contemptuous of the old-timers soaking in the neighborhood bath, the man has to admit their facilities beat anything Rome has to offer. It all rather overwhelms his Roman pride, while his chiseled looks overwhelm aspiring manga artist Mami Yamakoshi. After causing a great deal of naked commotion, Modestus quickly returns to his era, just as mysteriously as he left. Soon, he is the toast of Rome, applying the innovations he observed in Japan. His new found fame earns Modestus the ear of the stern but wise Emperor Hadrian and his thoughtful counselor Antoninus. Of course, the Emperor’s hedonistic adopted son Ceionius is a different story. Each time Modestus needs inspiration for a major commission, he somehow finds his way back to Japan and Yamakoshi, whether it be the upscale bathroom showroom where she works part-time or her mother’s rustic mountain spa. Eventually, she will pulled back to classical Rome with him, just in time for a major imperial power struggle. Based on a popular manga series that also spawned a short-lived anime incarnation, Thermae Romae has plenty of pratfalls and fish-out-of-water humor, but the cast plays it surprisingly straight. In fact, Masachika Ichimura and Kai Shishido play Hadrian and Antoninus as if they thought Sir Derek Jacobi might be popping round the set in his I, Claudius costume. Hilariously stone-faced Kore-eda regular Hiroshi Abe does not really have that option, given how much time Modestus must run about in his altogether. Still, he conveys a sense of the architect’s principled rectitude, even when embroiled in truly outrageous situations. In a role original to the film, Aya Ueto is likable enough as Yamakoshi, but she is saddled with a problematically passive character. There are plenty of Euro-looking Romans as well, dubbed into perfect Japanese to keep the madness chugging along at full steam. Partly filmed in Italy’s celebrated Cinecitta studio, Thermae’s period production scenes frankly look better than they needed to. It also observes the conventions of time travel movies, without getting bogged down in them. Lightweight but entertaining, it is a goofy romp that avoids all the cheap excesses of recent “Blank Movie” spoofs. Recommended for fans of time travel and manga-inspired films, Therma Romae screens tonight (7/14) at the Japan Society, as a co-programmed selection of Japan Cuts and the New York Asian Film Festival.